This level has medium difficulty. For this level try to play near to blockers or make special candy as you get the chance. 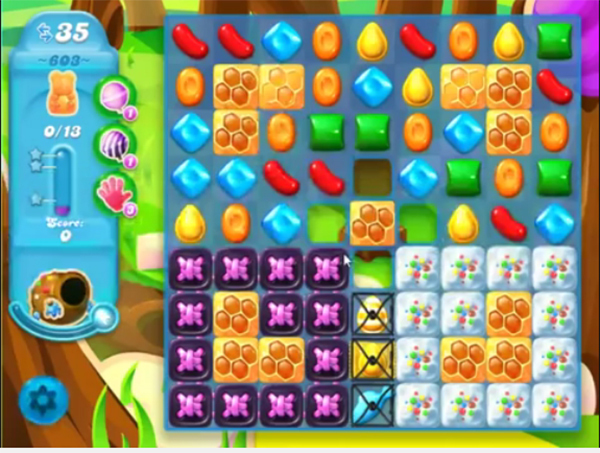 Try to combine special candies with each other to break more blockers to save the bears. Or take more help from the video below. Sick of these ridiculous levels that don’t have enough moves, no fun!!! SERIOUSLY???? Been playing this level for over a month now. Got to 1 bear left ONCE!! This whole game seriously needs to be tweaked. How ’bout SC lets me know when they do!! I hate this level! I’ve tried everything!!! I’m having NO fun with this level! After almost a month of trying, I’ve gotten to having two left. Not enough tries. HATE IT! This is too hard. I’m going to leave soda crush. How do I delete the 603 level without uninstalling candy crush soda. This level is impossible.